Besides death and taxes, the only other guarantee in life is Apple will never incorporate a printed manual with any release of the iPad. Experienced users see the benefit of no longer having a manual, while new users to the platform can be left perplexed. 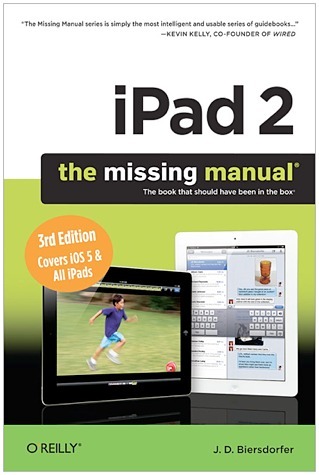 Luckily O’Reilly Media and author J. D. Biersdorfer have collaborated to release iPad 2: The Missing Manual for all those consumers who wish to know more about their iPad 2. The Missing Manual series of books delivers extensively more information than a traditional manual. You will be presented with information from how to turn on and configure your device, to advanced hints and tips, and relevant best usage information to assist you get the most out of your iPad 2.
iPad 2: The Missing Manual is presented within 360 pages and 15 chapters. Screenshots are included to assist with comprehensive understanding of the discussed topics. Chapter 1 will allow you familiarize yourself with your iPad 2. Activating in iTunes is extensively looked at to ensure errors are not made and you will also be informed on how to sync your device with iTunes both wirelessly and via USB. Readers will also be shown how to create and modify folders, switch between apps, and charge and extend the battery life. Chapter 2 becomes more interactive by helping you understand the various touch control options. The on-screen keyboard, including shortcuts, international keyboard layouts, and split keyboard options, are outlined. Cut, copy, and paste, along with search functionality, printing options, and using external keyboards, are also looked at along with their connectivity options. Chapter 3 deals with the essence of the iPad experience: online connectivity. Wi-Fi versus 3G is discussed at length along with public Wi-Fi hotspots and their associated security concerns. Mobile broadband options for AT&T and Verizon are presented as an example. Owners of an iPhone are also shown how to use the iOS Personal Hotspot in order to obtain 3G data on a Wi-Fi only iPad 2, thereby reducing overall monthly data bills. Skype calling is also considered for making international calls and a specific section is available for best practices when traveling internationally with the device. Chapter 4 details the Internet and associated website browsing. How to use Safari’s tabs, zoom and scroll functionality, Safari Reader and the associated reading list, autofill, bookmarks, and history management are all detailed. Syncing of bookmarks, mailing content from the Web, streaming audio and video, along with using online apps including social networking options are explored. Chapter 5 is all about communication. If you use email as a primary form of connecting with others then this chapter explains everything you will need to know. Setting up single or multiple accounts is presented along with touring the entire app, reading mail, working with attachments, writing and sending emails, and managing and filing your email content. POP (Post Office Protocol) and IMAP (Internet Message Access Protocol) setups and their differences are explained. Chapter 6 takes a look at all the built-in apps and their functionality on the iPad 2. Calendars, Contacts, Note Taking, Twitter, iMessage, Reminders, Notifications, Newsstand, Camera, Maps, Video App, Music App, and using the iTunes and App Store are all detailed in specific sub chapters. Chapter 7 goes deep into the App Store and how your Apple ID connects to everything you purchase. You will be shown a tour of the App Store and how to setup an Apple ID if you don’t already have one. Details are given to help you sign up for purchasing without a credit card, buy, download, install, and uninstall apps. Organizing, scaling, adjusting, troubleshooting, and updating apps are also explored. Chapter 8 takes a look at the iBooks app and associated bookstore. Readers will be given a detailed overview of how to search, browse, and purchase books of interest along with finding free books and adding non-iBookstore purchased ePub and PDF titles to the app. Options when reading a book within the iBooks app are looked at including how to search within the text of a book, use the installed dictionary functionality, bookmarks, highlights, notes, and visual controls to enhance the text size and background. Management of your books is also looked at. Chapter 9 is all about fun, specifically purchasing and playing games. Game Center and common multiplayer options are discussed. Chapter 10 declares break time is over and it’s time to get back to work. The iWork apps including Pages, Numbers, and Keynote are detailed. You will learn how to create documents and work with text and pages within the various templates available. Importing, sharing, and export options such as email, iTunes Sync, and iCloud are also explored. Chapter 11 presents a variety of ways to sync and share your media files with iTunes and iCloud. Detail is given as to how iTunes organizes and stores your content. Automatic and manual syncing options are discussed with their various options. Syncing music, video, photos, podcasts, books, and apps and games are detailed for their specific individual control options. This chapter also addresses how to de-authorize computers attached to your device along with how iTunes in the Cloud, iTunes Match, and iTunes Home Sharing work. Streaming and mirroring content via AirPlay is also included. Chapter 12 will help you refine iTunes in order to collate, control, and make your user experience seamless. Readers will be shown how to change the import settings for better audio quality, search and browse through content, use the graphic equalizer, edit media information, create playlists for content, and rate your music. Ping, Apple’s social network functionality for iTunes, is discussed along with how to add album artwork automatically or manually. Viewing your purchase history, setting up multiple iTunes Libraries, and moving your iTunes media folder to an external drive are detailed. Chapter 13 is all about the music: how to get audio content onto your iPad 2 including importing CD music into iTunes and buying music directly from the iTunes Store. Readers will be presented with how to play music, audiobooks, and podcasts along with the options available on the playback screen. Creating standard and genius playlists directly on the iPad 2 are explored. Chapter 14 gives you all the information you need to watch and edit videos. Detailed instructions are given on the best practices for transferring video to and from the iPad 2, compatible video formats, and editing videos on the iPad 2 using a variety of applications including iMovie. Chapter 15 addresses options for viewing, editing, and managing your photographs on the iPad 2. Readers will be presented with the best options for transferring photographs to and from the device as well as the integration with Photo Stream. Emailing, editing, presenting, and transferring photos using the iPad camera connect kit are explained. This chapter also explains how to change the wallpaper on the iPad and use it as a picture frame. Chapter 16 is all about protecting your data. Backup options to Apple’s iCloud service are explored as well as how to use Photo Stream. Appendix A takes a complete look at all of the settings for the iPad 2 and what each specific option will do. Appendix B is your troubleshooting area. You will be shown how to perform basic troubleshooting along with resetting your iPad 2, updating the software, and restoring from iTunes on your Mac or via iCloud. The iPad 2: Missing Manual, Third Edition certainly fills the void of information required to become a power user of your iPad 2. Despite being targeted to the iPad 2, original iPad users can also benefit from many of the areas discussed within this book as the only real difference between models is the included front and rear facing cameras. A reasonable volume of chapter 3 was assigned to information pertaining to readers in the US only. This not only isolates international readers but it also dates the book to a specific set of 3G service plans that are constantly changing. I believe this type information should be omitted in reference books. Overall the information is concise and clearly written with corresponding images to explain more difficult areas. Therefore, I am awarding this book a MyMac review rating of 8 out of 10.